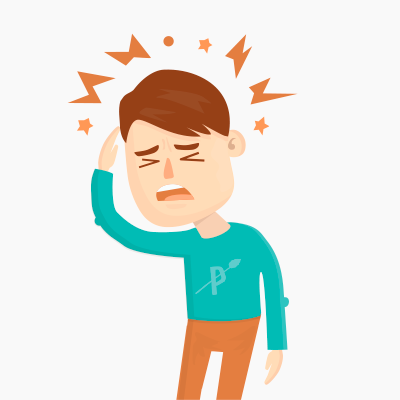 Take an ordinary headache, arm it with special high-explosive agony, whip it into a raging frenzy, and unleash it at your unsuspecting brain – that’s a migraine. On top of the crushing pain, the most famous symptom that separates migraines from regular headaches is the aura, a visual or sensory disturbance (blurry vision, blind spots, seeing stars, a feeling of tingling or numbness, or other symptoms) that precedes the pain. Only around a third of migraine sufferers also experience an aura, though, so it’s perfectly possible to have a legitimate migraine without one. Biologically, migraines are a neurovascular disorder – they’re related both to the function of neurons in the brain (neurological) and to the widening and constriction of blood vessels (vascular). The neurological changes in the brain during a migraine start in a part of the brain called the cortex and spread outwards (this is called cortical spreading depression, or CSD). In response to these chemical changes in the brain, blood vessels in the head dilate, or expand. Exactly how any of this causes the pain, nausea, dizziness, and sensory changes isn’t completely understood. About 12% of people overall are migraneurs (people who suffer from migraines), but the numbers are heavily skewed by gender, and much more common in women (around 25%). Unfortunately, the causes of these crippling headaches aren’t well-understood. Researchers have found links to dietary, environmental, and genetic causes, most of which are hotly debated and still under investigation. Diet and environment are both triggers that an individual can work to minimize, but genetics isn’t necessarily out of your hands, either. Of course, even the best Paleo diet can’t change your genes, but it can affect environmental triggers that influence the expression of those genes. The enormous amount of anecdotal evidence from people who adopted a Paleo diet and saw an incredible improvement suggests that something about it must be working, and there are several likely causes that seem to be supported by the existing research. Dietary migraine triggers are an interesting topic because migraneurs report them with a fairly high frequency, yet the results of actual studies are much less conclusive. The most common reported food triggers are caffeine, chocolate, cheese, alcohol, and MSG, although some individuals also have specific triggers that are less common. In research studies, however, tests using IgG and IgE antibodies (scientists use these to determine which foods might spark an allergic reaction) have often failed to show a significant correlation between foods the study subjects produce antibodies to and foods that trigger their migraines. This doesn’t necessarily mean that diet patterns don’t trigger migraines – they clearly do. But it does mean that allergies probably aren’t to blame. Not all food reactions are allergies, so what else could be the cause? Potential reactions to these foods wouldn’t be allergies, since they aren’t caused by the immune system incorrectly identifying a harmless particle as a threat. So sensitivities to tyramine, histamine, and arginine wouldn’t necessarily show up on the antibody tests given to migraine sufferers, even though they might be behind several of the most common food triggers. Another interesting diet connection with migraines is gluten (as if you needed yet another reason to avoid this nasty protein). Celiac disease is strongly associated with migraine headaches, and a gluten-free diet is a safe and effective remedy for many Celiac migraneurs. Since Paleo already cuts out gluten, and cheese, chocolate, alcohol, and nuts are all advised in moderation only, it’s possible that a standard Paleo approach brings relief from migraines almost accidentally, by removing common food triggers. The gluten connection raises another interesting connection between migraines and diet, this time relating to general gut health. One of the consequences of Celiac disease is the destruction of the intestinal villi, the tiny projections that line the walls of the gut. This damage can cause malabsorption and leaky gut symptoms. Since treating Celiac disease and allowing the gut to heal often results in an amelioration of migraine symptoms, it’s worth examining the connection to see if gut dysfunction might also play a role in migraines for non-Celiac patients. As it turns out, the link is quite plausible. Researchers have already identified the gut as the “second brain,” (technically called the enteric nervous system) a major site of nervous system reactions that constantly communicates with the “head brain” between your ears. Since migraines have a neurological basis, it’s possible that the communication between the “gut brain” and the “head brain” could affect them. The potential link could come through one of several channels. The first is hormonal. It’s no secret that the gut brain is an important mediator of mental health, in part because it’s the major source of the hormone serotonin. Gut conditions like IBS, Celiac disease, and Crohn’s disease disrupt the release of serotonin. The relationship isn’t all one-way, either: serotonin levels in the brain can also affect the gut. SSRIs (selective serotonin reuptake inhibitors, a common medication for depression) frequently cause gut symptoms by disrupting the body’s production of serotonin. Among other things, serotonin is responsible for regulating mood and sleep, and dysregulated levels of serotonin are associated with mental disorders like depression and anxiety – and with migraines. Like anxiety and depression, migraines are driven at least in part by imbalances in serotonin production. Even though not everyone with migraines has a leaky gut, and not everyone with a leaky gut has migraines, it’s likely that a gut disorder causing abnormal serotonin levels might contribute to the development of migraines. The second link between gut health and migraines has to do with hypersensitivity in both the “gut brain” and the “head brain.” One cause of the discomfort that so many IBS patients suffer from is hypersensitivity of the enteric nervous system – their gut is simply more aware to the slightest irritation and more likely to react to substances that wouldn’t cause any trouble to a healthy person. Celiac patients are also hypersensitive, although their reactions focus specifically on gluten. Migraines are also associated with an exaggerated nervous response to stimuli like light and noise. Since migraines are correlated with both Celiac and Irritable Bowel Syndrome, some researchers speculate that a hypersensitivity response could start in either the central or the enteric nervous system, and affect the other as well. In other words, the heightened sensitivity of the gut due to conditions like IBS or Celiac could provoke the central nervous system (the “head brain”) into a state of hypersensitivity as well, triggering migraines. This is all fairly speculatory research, but it does seem to suggest that the link between the enteric and the central nervous systems might play a role in the development of migraines – which could explain why so many people find relief from their migraines on Paleo. If gut dysfunction plays a role in the hormonal imbalances that drive migraines, healing the gut flora with a Paleo diet would probably help. And if gut sensitivity and irritation is a migraine trigger, removing gut-irritating foods like grains and legumes might help prevent further migraine attacks. As well as more general dietary benefits like healing the gut, Paleo might be beneficial to migraneurs because it contains significant levels of several micronutrients connected with migraine headaches. One of these is magnesium, a mineral well-known for its relaxing effects. The specific reason why magnesium is particularly beneficial for migraines isn’t clear, but the connection exists: not only do migraneurs have lower levels of magnesium during a headache, but supplementation can help relieve symptoms or even prevent the migraines altogether. Magnesium is naturally found in fruits and vegetables, so it’s very likely that switching from a standard Western diet to Paleo could involve a dramatic increase in magnesium consumption. The amount of magnesium in produce depends on the soil it was grown in, though, so increased vegetable intake doesn’t affect everyone equally. This map shows the soil magnesium content in the continental US; if most of your food comes from magnesium-poor areas, it might be helpful to take a supplement. Since magnesium supplementation is safe, easy, and inexpensive, it’s definitely worth a try. Another potential explanation for Paleo migraine relief is the high levels of B vitamins in a diet that embraces red meat. At least one study has demonstrated that supplementation with B vitamins can help reduce migraine frequency and intensity. Since high-quality animal products are such an excellent source of B vitamins, it’s not surprising that leaving a life of cupcakes and Lean Cuisine for daily doses of fresh green veggies and pastured meat could help reduce migraine symptoms. As well as specific foods, many other factors known migraine triggers could also be connected to Paleo and lifestyle. One of these is hormonal. Migraines that center on women’s menstrual cycles are so common that there’s even a special name for them: catamenial migraines. Over half of all women with migraines report that their symptoms revolve around their menstrual cycle, especially in the last few days before their period starts, and the first few days of bleeding. Fluctuations in estrogen and progesterone, the main hormones driving the female reproductive system, cause these menstrual migraines by changing the levels of serotonin in the brain. Interestingly enough, the hormonal changes in female migraneurs are perfectly normal; it’s the body’s response to them that causes the headaches. This is why many women with migraines feel better during pregnancy and after menopause, when hormone levels are more stable. Given that these hormonal fluctuations clearly drive so many women’s migraines, it’s not impossible that removing sources of environmental estrogens and dietary phytoestrogens like soy might play a part in reducing migraines on a Paleo diet. Another frequent migraine trigger is stress – not only the chronic stress of a lousy job or the short-term stress of planning a special event, bus also more physical stressors like intense exercise or missing a meal. Some of these stressors can even be beneficial in the long run (exercise, for example, is healthy because the body “bounces back” and becomes stronger after the stressor than it was before) but still function as migraine triggers. Since many people also start to realize the long-term danger of chronic stress when they start to look into a Paleo diet, the stress-reducing Paleo lifestyle could definitely have something to do with migraine relief. One fascinating avenue into dietary research for migraines concerns the potential benefits of a ketogenic diet. The similarities and connections between migraines and epilepsy suggest that ketosis, a proven therapy for epileptic patients, might be extremely beneficial for migraneurs as well. In ketosis, the body is fueled by fat (ketone bodies) rather than glucose (carbohydrates) – this helps epileptic patients by changing the metabolism of the brain, and the same changes might be beneficial for migraneurs. Specifically, the link between ketosis and migraines is that ketones prevent the buildup of a neurotransmitter called glutamate. Some research has suggested that migraneurs suffer from high levels of glutamate because they have a genetic mutation that prevents them from regulating it properly. The ketone bodies produced on a ketogenic diet might effectively make up for a genetic predisposition to migraines, taking over the job of glutamate regulation. Paleo doesn’t have to be ketogenic, but it often is and it certainly can be. Many people prefer a ketogenic version of Paleo for weight loss, control of diabetes, or other metabolic disorders; it’s possible that “migraine control” should also be on that list. Like other complex neurological conditions, migraines are clearly not a one-size-fits-all problem. From the enormous amount of anecdotal evidence, it’s clear that a Paleo diet must be somehow beneficial for migraneurs, but the cause isn’t easy to pin down. Is it the improved gut health? The lack of gluten? The more relaxed lifestyle? Ketosis? Quite possibly, the answer includes a little bit of everything and is different for every person. But from what we do know, there seem to be several potential links that are definitely worth exploring. Strictly avoid gluten, as well as any other personal trigger foods. Avoid foods high in tyramine, histamine, and arginine. Avoid intermittent fasting, since skipping meals is also a common trigger. Get plenty of sleep, and practice stress management techniques like meditation and journaling. Make sure to get enough magnesium and B vitamins. If you have IBS symptoms, experiment with different foods to see what helps – starting with FODMAPs is probably a good bet. The advantage to all of these suggestions is that they’re widely available, inexpensive, and safe for almost everyone. As a complement to these efforts, a non-dietary form of traditional medicine that doesn’t include any medications is acupuncture. Acupuncture is more associated with the vegan crowd than with Paleo, but it does fit with the Paleo principle of seeking non-toxic alternatives as a first choice, and it’s perfectly compatible with an overall Paleo lifestyle. And it’s a proven therapy for migraine relief that doesn’t involve loading down your body with pharmaceutical painkillers. Seeking out chiropractic care is another non-invasive and natural option, especially for people who are triggered by stress. Some people still need headache medicines on occasion, but addressing the cause is much preferable to treating the symptoms with increasing doses of medication, especially when that medication can be so dangerous. Pharmaceutical headache remedies are expensive, often habit-forming, and can even cause “rebound headaches” from the withdrawal symptoms. Some people need them in addition to other therapies, but there’s no reason these drugs should be a first resort when there are so many other safer interventions to try first. “May have an effect,” “might be related to,” “seems plausible that” – this article is long on theory and short on decisive proof, mostly because the decisive proof doesn’t yet exist. It’s clear that a Paleo diet does bring relief to a significant number of migraneurs, but the specific reasons are still up in the air. Even so, there are several likely links between Paleo and migraine relief, including lower stress levels, a gluten-free diet, better gut health, and a high micronutrient content. A ketogenic version of Paleo might be even more helpful, and it’s possible to tweak the diet in several other ways to avoid specific food triggers. As scientists conduct further research into diet and migraines, hopefully some of these links will become clearer, and migraine sufferers will be able to make even more effective dietary changes to help control their headaches.